The EDB was set up in 2000 to be a catalyst for helping Bahrain diversify away from oil and gas into new emerging sectors, and also to help drive government reform to ensure that Bahrain remains business friendly. But in the last couple of years we’ve moved toward becoming a more traditional investment promotion agency. We work with companies around the world, attracting them to Bahrain, helping them through that journey and supporting them through the process of setting up or, if they’re already in Bahrain, helping them to expand. What does that support entail? It’s really being a catalyst and also a signpost for companies. We don’t try to do everything. We try to make sure they get the right support at the right time depending on where they are in that process. So funding might not come directly from us, it might come from our sister organisation Tamkeen [a semi-autonomous government agency in Bahrain founded in 2006 to provide assistance and training to private-sector businesses]; it might come from the private sector. Where we do very much help is in terms of business registration, the policy side, making sure the regulations are as friendly as possible. If I had a small business idea how would you help me? First of all we would work out what type of license you would need and we’d help you to get those licenses. If you’re very small we might suggest you start off in one of the co-working spaces where you’re surrounded by likeminded companies and you could maybe collaborate. Thirdly, we would introduce you to potential customers. Bahrain is small so everybody is connected to everybody else and that can lead to new opportunities. And there could be other forms of support. For example, if you recruit Bahraini graduates there are some quite generous support schemes that will cover a significant portion of the salary costs for the first three years. There are other grants if you employ Bahrainis. So there are a whole raft of things that you can tap into. And because you’re not restricted to special economic zones you’re free to open your office wherever you like, which is very cost effective, and we'll help you find something suitable. Can you set up meetings with potential VCs? We do. Not everyone is looking for VC funding because we’re dealing with everyone from big multinationals such as Mondelez, which is expanding its manufacturing plant in Bahrain, and Amazon Web Services (AWS) which has its first major regional data centre in Bahrain, to SMEs and start-ups that are coming in to grow their businesses almost from scratch. Those are the companies that might be looking for investors and we help with that process. But in the early stages it might be more about angel investment. It’s an interesting mix. One of Bahrain’s strengths is that although it’s very small that also means easy access to decision makers, investors, clients and customers. And that works quite well. In terms of the companies themselves, we work with big names such as DHL and Huawei, and we’re also seeing a lot of high-growth companies coming in, and one of the more interesting areas at the moment is fintech. We’re doing well because we have the Central Bank on-board in terms of developing new regulatory frameworks to allow fintech companies to flourish. Bahrain has been a financial centre for the past three decades and most people that work in financial services are Bahrainis, so you’ve got a great pool of talent to draw upon. This is a bit different to other GCC economies where it’s more about expats coming in on three year contracts. And the other key thing for us is that most of the fintech regulations are not restricted to a special economic zone. They’re onshore, meaning that any start-up can come into our regulatory sandbox, come into our new Fintech Bay, which is the largest co-working space for fintech in this region, and have 100 percent foreign ownership. How is Fintech Bay performing? Pretty good. We’re working with an organisation called the Fintech Consortium, which originally started in Singapore, and it is bringing companies in from overseas. We’re also getting some of the traditional banks from Bahrain to put their fintech teams in this shared space. The Central Bank now has a small fintech unit that will spend quite a bit of time at Fintech Bay, which is a great focal point that assists in what we are trying to do. Of course you need great start-ups and entrepreneurs, but you also need the corporates that could be their first customer or investor that could adopt that technology and work together. And the corporates also need access to this talent. Also, a lot of people don’t want to join a big multinational bank; they want to set up their own business. A good way to tap into this talent pool is by setting up an accelerated space where these people can work with the banks. The other thing though, and it’s quite specific to fintech, is that most people starting fintech businesses are not teenagers in garages. They tend to be fairly experienced managers who may have worked for a financial institution. They could be in their 30s, 40s or even 50s. They are people who have spotted a gap in the market and are only ready to give up their well-paid jobs when they’re really sure that their venture will get off the ground. So I would say there is a good number of fairly mature start-up founders and they work very well with the big financial institutions. 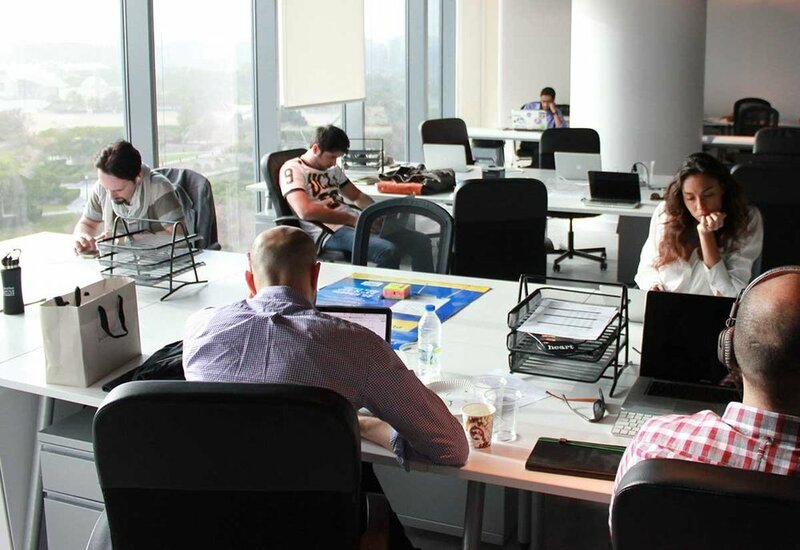 We’ve got a really good group of accelerators that have chosen to relocate and set up units in Bahrain. We have Brinc (www.brinc.io), which is an IoT hardware company that is partnering with our main telephone company, Batelco. We have Flat6Labs (www.flat6labs.com) which has just announced that it will open a new accelerator in Bahrain, and has a regional reach that is going to be very important. We have CH9, a home-grown co-working space that partners with other start-up ventures around the world. We have C5 Capital, a technology investment firm that is linked very closely to Amazon Web Services in supporting and developing cloud-based start-ups. So it’s a good mix of accelerators and most have only set up here in the last 18 months. The other important thing is that we also see people coming in from Saudi Arabia and elsewhere in the region, and we’re starting to get scale-ups from other major start-up hubs around the world. So this is a sweet spot for Bahrain. Whereas in the UAE you have a huge number of foreign start-ups and in Kuwait they’re focusing very much on local SMEs, Bahrain has an interesting mix of both. We all love Amazon Web Services because it has been a game-changer for Bahrain. It took a real team effort to get AWS to choose Bahrain. The government was willing to put in place the right regulations and to work with them every step of the way over a two-year period. And that has got a lot of other people interested as a result. There are some smaller success stories. Pay Tabs is one of our home-grown fintech companies, founded by a Saudi entrepreneur in Bahrain. It’s growing very well and has attracted significant funding and hired new staff. What are the challenges in Bahrain? The challenge for us is recognition. We have to remind people that we are still an economy that has zero tax, with a really good workforce that is actively involved in the private sector. We are as much as 40 percent less expensive than some cities in the region for certain activities. And then we’ve got tremendous connectivity to Saudi Arabia. If you are not actually based inside Saudi then the next best thing is to be in Bahrain and to have access over the Causeway to the Eastern Province. One of the other challenges, though, is that Bahrain has been recognised as a pioneer in the past - the first major financial centre, the first major aviation centre, the first place to educate men and women in the region, the first to discover oil in the GCC... We have lots of firsts behind us and now we’ve got to show that Bahrain is still a pioneer. That means emphasising the newer opportunities. $32bn is being spent on physical infrastructure projects that create opportunities for sub-contractors and suppliers. We’re upgrading many laws and regulations, expanding the list of business activities that are open to100 percent foreign ownership, revising our trust laws, revising our limited partnership law to allow venture capital firms to be more involved in Bahrain, revising our insolvency law. All these things are very important to make sure we remain business friendly.